In April 2005 EPN reported evidence for a late Permian fall in atmospheric oxygen concentration to about 16% from its all-time high of 30% in the Carboniferous and earlier Permian.. This would have reduced the highest elevation on land where animals could live to about 2.7 km above sea level, compared with 4 to 5 today. Such an event would have placed a great deal of stress on terrestrial animal families. Moreover, it implies anoxic conditions in the oceans that would stress marine animals too. At the time, it seemed unlikely that declining oxygen was the main trigger for the end-Permian mass extinction as the decline would probably have been gradual; for instance by oxygen being locked into iron-3 compounds that give Permian and Triassic terrestrial sediments their unrelenting red coloration. By most accounts the greatest mass extinction of the Phanerozoic was extremely swift. The possibility of extinctions being brought on by loss of oxygen from the air and ocean water has reappeared, though with suggestion of a very different means of achieving it (Wei, Y. and 10 others 2014. Oxygen escape from the Earth during geomagnetic reversals: Implications to mass extinction. Earth and Planetary Science Letters, v. 394, p. 94-98). The nub of the issue proposed by the Chinese-German authors is the dissociation and ionization by solar radiation of O2 molecules into O+ ions. If exposed to the solar wind, such ions could literally be ‘blown away’ into interplanetary space; an explanation for the lack of much in the way of any atmosphere on Mars today. Mars is prone to such ionic ablation because it now has a very weak magnetic field and may have been in that state for 3 billion years or more. 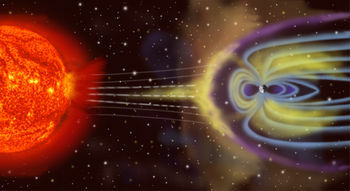 Earth’s much larger magnetic field diverts the solar wind by acting as an electromagnetic buffer against much loss of gases, except free hydrogen and to a certain extent helium. But the geomagnetic field undergoes reversals, and while they are in progress, the field drops to very low levels exposing Earth to loss of oxygen as well as to dangerous levels of ionising radiation through unprotected exposure of the surface to the solar wind. Field reversals and, presumably, short periods of very low geomagnetic field associated with them, varied in their frequency through time. For the past 80 Ma the reversal rate has been between 1 and 5 per million years. For much of the Cretaceous Period there were hardly any during a magnetic quiet episode or superchron. Earlier Mesozoic times were magnetically hectic, when reversals rose to rates as high as 7 per million years in the early Jurassic. This was preceded by another superchron that spanned the Permian and Late Carboniferous. Earlier geomagnetic data are haphazardly distributed through the stratigraphic column, so little can be said in the context of reversal-oxygen-extinction connections. Wei et al. focus on the end-Triassic mass extinction which does indeed coincide, albeit roughly, with low geochemically modelled atmospheric oxygen levels (~15%). This anoxic episode extended almost to the end of the Jurassic, although that was a period of rapid faunal diversification following the extinction event. Yet it does fall in the longest period of rapid reversals of the Mesozoic. However, this is the only clear reversal-oxygen-extinction correlation, the Cenozoic bucking the prediction. In order to present a seemingly persuasive case for their idea, the authors assign mass extinctions not to very rapid events – of the order of hundreds of thousand years at most – which is well supported by both fossils and stratigraphy, but to ‘blocks’ of time of the order of tens of million years. My own view is that quite possibly magnetic reversals can have adverse consequences for life, but as a once widely considered causal mechanism for mass extinction they have faded from the scene; unlikely to be resurrected by this study. There are plenty of more plausible and better supported mechanisms, such as impacts and flood-basalt outpourings. Yet several large igneous provinces do coincide with the end of geomagnetic superchrons, although that correlation may well be due to the associated mantle plumes marking drastic changes around the core-mantle boundary. According to Wei et al., the supposed 6th mass extinction of the Neogene has a link to the general speeding up of geomagnetic reversals through the Cenozoic: not much has happened to either oxygen levels or biodiversity during the Neogene, and the predicted 6th mass extinction has more to do with human activity than the solar wind.